A NEW wave of anti-parenting is sweeping through, with mum and dad narcissism peaking before we've barely made it through the schoolyard summer. I call it anti-parenting because these myopic individuals publicly devoted to raising history's most loved and enhanced children are, in fact, the architects of childhood misery. Their insufferable ignorance and often serial rudeness is only brewing problems for their precious offspring - the very humans they claim to protect and nurture. Case in point this week is a pregnant social media influencer who said she doesn't trust hospitals and will never vaccinate her kids. 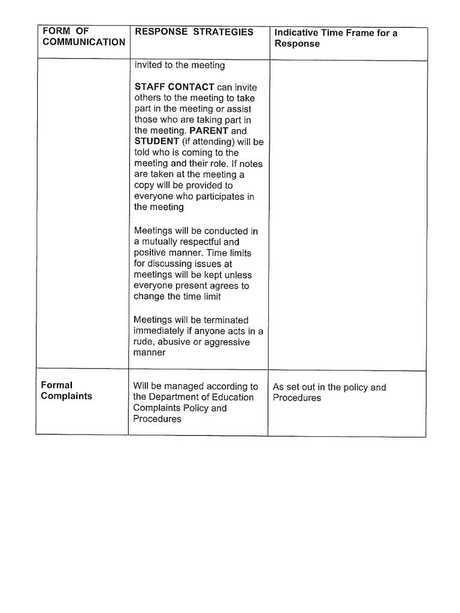 Meanwhile, a prestigious Sydney school has had to quarantine its staff from overzealous parents who have no concept of boundaries and appropriate behaviour when dealing with a teacher. Selfish behaviours like these rob children of so much opportunity to form social bonds unhindered by parental influence and also to explore friendships. Sure, these are not always going to be positive interactions but they provide invaluable foundations in which children learn about conflict, tolerance, accountability and acceptance. 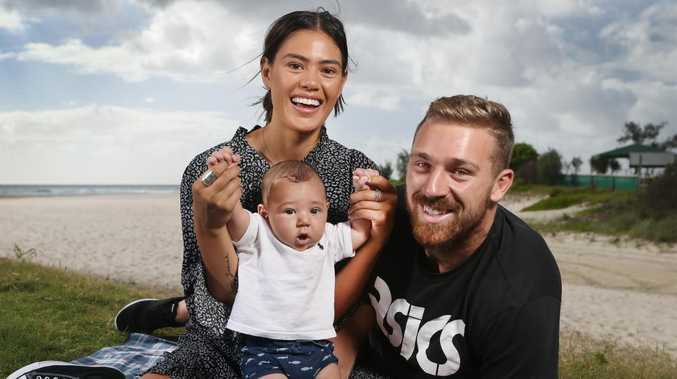 The wife of NRL player Bryce Cartwright, pregnant with their second child, this week announced that their kids won't wear nappies or be vaccinated. Ever. Shanelle Cartwright broadcast her controversial parenting choices during an Instagram Q&A session. Of course. 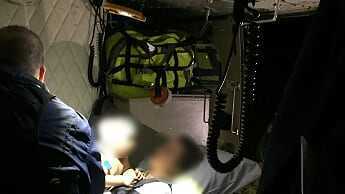 "He is not vaccinated; none of our babies will be," Cartwright said of her 13-month-old son Koa. Ask any nurse or doctor in our mainstream health system - the system that anti-vaxxers ultimately rely on when things go wrong - and they will tell you they are heartily sick of this dangerous mindset. The Cartwrights say they both researched the topic before making a decision, but worryingly cited a prominent anti-vax American medic, Dr Suzanne Humphries. 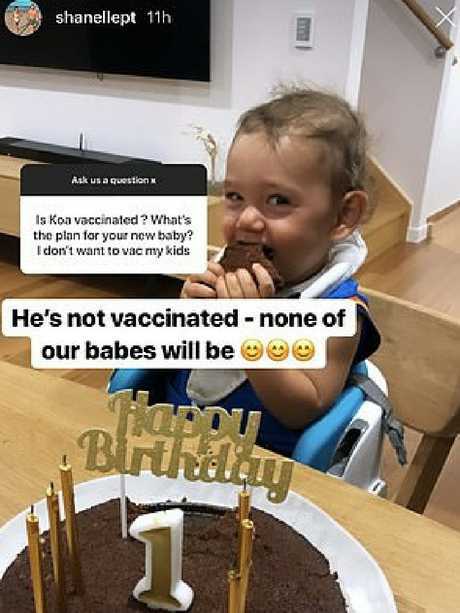 "I remember he [Bryce] was so defensive when I first brought it up and got angry at me for even suggesting that we shouldn't vaccinate," Cartwright said. 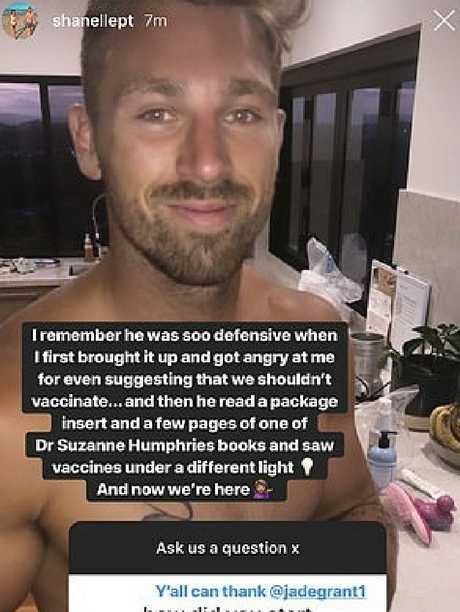 "And then he read a package insert and a few pages of one of Dr Suzanne Humphries books and saw vaccines under a different light. And now we're here." Inevitably, Cartwright was asked how she would handle school, as the decision to not have them vaccinated could have an effect on their options. "They can go to school (so far)… if the law changes, I'll home school before I vaccinate," she said. Breezily describing themselves as lo-tox, the couple said their new baby won't wear nappies and will toilet train via the elimination communication method, whatever fresh hell that is. Again, it seems being different and social media relevant in a sea of influencers comes at the expense of common sense and comfort for kids. By not vaccinating your child, not only do you put other children at risk of diseases that can - and do - kill, but we are seeing increasing levels of legislation that are precluding unvaccinated children from joining in. As they say, no jab, no play. Which begs the question, why would you do that to your own child? 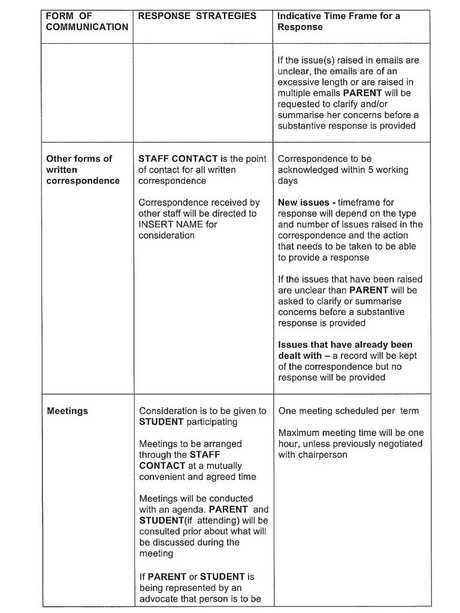 And so to parents who are being blocked from contacting teachers. Sadly, this comes as no real surprise. According to a report on Wednesday, the principal of the prestigious Conservatorium High School was forced to issue the parents of three students with a "Communications Protocol" restricting their contact with teachers after these self-obsessed tigers were accused of bullying in 2017. Apparently, the protocol includes restricting parents to sending just one email per week and covering a maximum of three issues. "Your communications have been via telephone, text, email, impromptu visits to the front office, appointments with staff, and directly with teachers outside classrooms," Principal Robert Curry wrote. I have friends who are school teachers and I've been sat next to them while their phones have been buzzing late at night, parents on the prowl and wanting answers. Again: why would you do that to your own child? It seems to be the mantra of these parents who are determined to smooth the way and create a life of success for their child is that failure is not an option. But that's what kids must have in their lives to become whole, healthy, resilient and functioning humans. This is a dystopian slope disguised as stifling parental love and intense need to control everything about their child's environment and experience, yet there are three things parents will never have the power to avoid completely: childhood diseases, failure, and disappointment. How they choose to face those demons, though, will shape their children's lives forever - or end them prematurely.